Set footer fixed to bottom – option to enable/disable the footer fixed scroll effect. Upper footer background – select the upper footer background color. Lower footer background – select the lower footer background color. 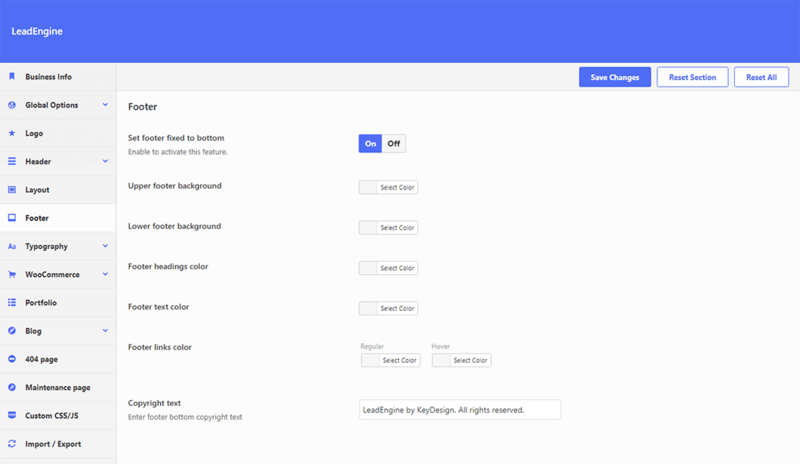 Footer headings color – select the text color used for the footer widget titles. Footer text color – select the text color used for the footer widget paragraphs. Footer links color – select the text color used for the footer links. Copyright text – enter your website copyright text. Footer menu configuration. To configure the footer menu please see this article.